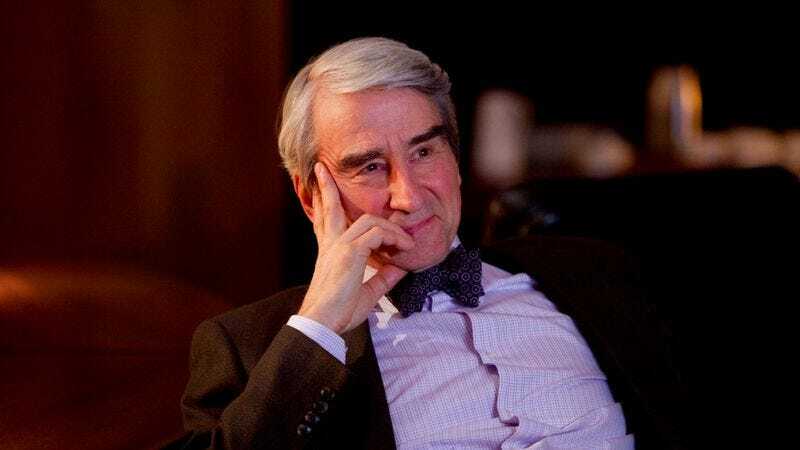 Sam Waterston’s ability to speak in a supremely trustworthy voice made him the perfect person to play Jack McCoy on NBC’s Law & Order for more than a decade and a half. His refusal to rest on his laurels has brought him back to the small screen for another full-time series gig, playing the head of a cable news network in Aaron Sorkin’s new HBO series, The Newsroom. Waterston recently spoke with The A.V. Club about the role of Charlie Skinner and his enjoyment of the mysteries surrounding the character, his relationship with the late Jerry Orbach, and the legacy of Old Glory Robot Insurance. The A.V. Club: Jeff Daniels acknowledged that the siren song of Aaron Sorkin had more than a little bit to do with his decision to sign onto a TV series. Presumably it had a bit to do with yours as well. Sam Waterston: Are you kidding? [Laughs.] Yes! Absolutely. No question. Although I actually only saw it by accident, because I don’t really read the trade papers very often. But there was one lying around the house, and I saw that he was doing a television series, and I thought, “I want to be in it.” But then I let it go. When my wife saw the article, too, though, she said, “You really should do something about this.” So yeah, I think for everybody, this was kind of an obvious call. AVC: Still, you basically just came off of playing Jack McCoy for more than 350 episodes of Law & Order. Didn’t anyone tell you you’re allowed to relax? SW: By the same token, I haven’t given the audience much of an opportunity to rest, either. [Laughs.] But I like to work, and this was something you’d never want to pass up if there was a chance at getting it. AVC: On paper, the head of a cable news network could’ve been a stern authority figure, trying to keep the newscaster in line, but Charlie Skinner seems to spend more of his time encouraging Will McAvoy to break out of the current expectations of TV anchors. SW: Not on this paper. [Laughs.] Not the way Aaron thought of him. AVC: How was the character described when you first got the script? SW: You know, I guess you could say this about any really good writer, but the description of the character is in what he says. It’s very clear who he is from what he says. There are certainly plenty of unanswered questions about him, but that’s part of what’s interesting and intriguing about playing him, because while those questions are unanswered, the actor is given all kinds of latitude. Also, it’s good that there’s mystery there. The most obvious one I’m thinking of is the fact that we don’t know whether his drinking makes him a better or a worse executive. [Laughs.] We don’t know whether it impairs him or liberates him, and whether being impaired or liberated is actually a good thing for our hopes that the heroes will triumph in the end. But there’s lots like that. AVC: One of the other uncertainties is what sort of history exists between your character and Jane Fonda’s. It’s clear that they have one, but it’s murky as far as how well they know each other. SW: Yeah, what’s that going to be? Is it going to be anything? [Laughs.] There’s a whole lot of “we understand each other” and “not so fast, buster” from both sides. So there’s a lot of room, and all of that uncertainty… One of the greatest pleasures of doing this was coming to work on the days that a new episode came out, and being surprised. So I feel like there’s going to be a whole lot more surprises. AVC: Jeff had the DNA of a lot of different newsmen in his character that he could draw from if he’d wanted. Was there anyone behind the scenes you were trying to emulate? SW: I wasn’t trying to… You know, over the years I’ve played journalists, I was involved in Unity08, so I talked to an awful lot of people in the political world, and appeared on TV shows and talking-heads shows and stuff like that, and I’ve met a whole lot of people in the news business. But this is not modeled after anybody. And really, it’s what I said before. I don’t know who Aaron was thinking of, but he was thinking of somebody. A real, complete human being, with much more of the iceberg underwater than is apparent in what he says at any one time or on any one show. So I just spent most of my time trying to figure out what that iceberg looked like. AVC: The relationship between Charlie and Will is like, you’re the father figure and he’s the rebellious surrogate son. SW: Yeah, I think Charlie Skinner loves the news business, and he loves the people he’s working with. There’s a lot of easy transfer there for me, because I love the acting. I love the part of show business that has to do with acting with a lot of wonderful people. So I can just take that whole and use it in the show. AVC: Do you find the patter of Aaron’s dialogue easy to deliver? SW: My son James says his favorite line from Shakespeare is, “It hath no bottom,” which is from A Midsummer Night’s Dream, and there’s a character, as you know, called Bottom. But the thing that’s terrific and tricky about Aaron’s writing is that it doesn’t, really. The more you go into it, the more there turns out to be there, and you really can’t… In TV, you always run out of time. You usually run out of time before you get to the bottom of anything, so you just have to go with what you’ve got, or take a flying leap, not knowing whether there’s any water in the pool. And that’s the case with this stuff. The dialogue is coming from somewhere. It’s got a lot of surface glitter, and it’s very brilliant, but it’s also got a lot of depth. You never really get to the bottom of it before they say, “Action!” [Laughs.] Which is fun. But it’s also living on the edge. AVC: How do Aaron Sorkin’s walk-and-talks compare to the experience of doing Mindwalk? SW: Oh, I never thought of that. But that’s a really good parallel! Because they’re both… Mindwalk was the talkiest talkie I’d ever been in until Aaron Sorkin. SW: Yeah! [Laughs.] Gee, thank you for that. I’d never thought of that! AVC: The Newsroom’s structure seems to allow Aaron to retroactively right some of the wrongs he’s seen in TV journalism over the past few years. AVC: What are your thoughts on the state of TV journalism? Or is that too big a question for the time we have allotted? SW: Oh, I think we’re just… I think it’s a gigantic mess, don’t you? I think there are an awful lot of very well-intentioned people in it, but the system… the way we get our news about the important questions of the day, it’s just enough to make you want to hang your head in despair. It’s too bad. I don’t know what the fix is. But it certainly is a very messy, sloppy way. And I’ve done enough historical drama and stuff like that to know that this is not a new problem, but it does seem to be in an acute stage, at least to me. AVC: Regarding one of those historical dramas, when you played Robert Oppenheimer in the Oppenheimer miniseries, did it affect your opinions on nuclear energy, either as a weapon or as a power source? SW: Well, there wasn’t much talk in that show about using nuclear energy as a power source, but the big takeaway from the making of the atomic bomb was that it was such a big weapon that it scared the people that thought of it. It scared them right down to the ends of their toes. So I guess that’s the big takeaway I had from that, too. AVC: When it comes to playing real figures from history, do you go out of your way to research the parts in advance, or can that prove to be a distraction on occasion? SW: Well, my old friend John Hurt said that acting is an act of the imagination. I’m crazy about doing research. I love it. I’ve become sort of an addict of Abraham Lincoln; I had an excuse to do a lot of research into that period because of playing him, and I don’t regret a minute of it. But in the end, John Hurt’s right: You make it up. And that applies to The Newsroom, too. We get this little tidbit and that piece. Mainly what research does for you is that it makes you feel like you’ve got solid ground under you. But the rest of it, you’re making up. AVC: Not that it’ll be the first revisitation of the material since you tackled it, but do you have any thoughts on Baz Luhrmann’s upcoming take on The Great Gatsby? SW: I’m looking forward to seeing it. I think it’s damned impertinent of people to come along and do parts I’ve already played, but… [Laughs.] No, I’m very curious to see it. I loved the book, and I loved shooting it myself. I had a wonderful time with all those people, and with Jack Clayton, who was just a wonderful man and a wonderful mentor, because it was the first big movie I was ever in. And in those days, big movies were really big. I mean, it took stevedores to move the lights around. [Laughs] So I just wish them the best, and I hope it gets that wonderful book in front of more people’s noses! AVC: Are you aware there’s a small but loyal cult within the steampunk movement surrounding your series Q.E.D.? AVC: It’s more or less science fiction or fantasy revolving around an era where steam power is predominant, but there are usually a fair number of technological anachronisms. SW: Oh, well, then, Q.E.D. would be right up their alley. [Laughs.] We did television and all of that other stuff. Oh, we had a lot of fun on that show. A lot of fun. And some of that stuff was amazing. Like those race cars. They were all collectors’ items. There was a chain-driven Mercedes Benz that was capable of going 110 miles an hour that this guy brought to the shooting location by driving it himself up the motorway. And, you know, everything about the accelerator was terrific. The brakes were really scarily inadequate, though. [Laughs.] But it could go like blazes! AVC: On the other end of the spectrum, as far as the length of the show’s run, the structure of Law & Order lent itself to a revolving-door format for its characters. Setting aside Mr. Orbach for the moment, did any departures hit you harder than others? SW: [Quietly.] Well, you certainly named the biggest one. But… it’s a very rare thing to experience something like Law & Order. It was an institution, which is something most jobs in show business most definitely are not, and part of the nature of an institution is that it goes on as people come and go. I’d never really had that experience before. I’d never had a job that steady before, and I haven’t after. So this business of making good friends and having them depart happened pretty regularly. And there were a lot of losses. But there were a lot of wonderful new people that came, and you sort of began to see it that way. AVC: You and Jerry Orbach had some of the longest tenures on the series. SW: Yeah. We didn’t work together that much, though. We passed each other in the halls. But I got to know him as a man over the years, and he was a very extraordinary man. AVC: Had you ever crossed paths with him in the theater prior to Law & Order? AVC: Do you have a favorite project that you’ve worked on over the years that didn’t necessarily get the love you thought it deserved? SW: I hope that’s true! AVC: But with that said, there would very likely be a human uprising if the matter of your work with Old Glory Robot Insurance wasn’t brought up. SW: [Laughs.] That… is my finest hour. AVC: Do you know if your trusting tone in that commercial had anything to do with you pulling the recurring gig on The Colbert Report, for “Sam Waterston Says Things You Should Never Believe In A Trustworthy Manner”? SW: I don’t know whether that’s why they thought of me, but I’m forever grateful. I think he’s the funniest man on the planet, and also the bravest. My knees still get weak when I think about that correspondents’ dinner. [Laughs.] But I’m honored and flattered to have been on his show. And, you know, we did the rally, too. [The Rally To Restore Sanity And/Or Fear. —ed.] I was there for that, too. I got to read the greatest poem ever written: “Are You Sure?” [Laughs.] Man, that was great.